We might not be able to use common insecticides to kill mosquitoes that arrive from other countries. Planning a trip to the tropics? You might end up bringing home more than just a tan and a towel. Our latest research looked at mosquitoes that travel as secret stowaways on flights returning to Australia and New Zealand from popular holiday destinations. We found mosquito stowaways mostly enter Australia from Southeast Asia, and enter New Zealand from the Pacific Islands. Worse still, most of these stowaways are resistant to a wide range of insecticides, and could spread disease and be difficult to control in their new homes. Undetected insects and other small creatures are transported by accident when people travel, and can cause enormous damage when they invade new locations. Of all stowaway species, few have been as destructive as mosquitoes. Over the past 500 years, mosquitoes such as the yellow fever mosquito (Aedes aegypti) and Asian tiger mosquito (Aedes albopictus) have spread throughout the world’s tropical and subtropical regions. Dengue spread by Aedes aegypti mosquitoes now affects tens to hundreds of millions of people every year. Explainer: what is dengue fever? Mosquitoes first travelled onboard wooden sailing ships, and now move atop container ships and within aircraft. You probably won’t see Aedes mosquitoes buzzing about the cabin on your next inbound flight from the tropics. They are usually transported with cargo, either as adults or occasionally as eggs (that can hatch once in contact with water). It only takes a few Aedes stowaways to start a new invasion. In Australia, they’ve been caught at international airports and seaports, and in recent years there has been a large increase in detections. Aedes aegypti mosquito detections per year at Australian international terminals – passenger airline terminals in white; seaports or freight terminals in black. In our new paper, we set out to determine where stowaway Aedes aegypti collected in Australia and New Zealand were coming from. This hasn’t previously been possible. Usually, mosquitoes are only collected after they have “disembarked” from their boat or plane. Government authorities monitor these stowaways by setting traps around airports or seaports that can capture adult mosquitoes. Using this method alone, they’re not able to tell which plane they came on. But our approach added another layer: we looked at the DNA of collected mosquitoes. We knew from our previous work that the DNA from any two mosquitoes from the same location (such as Vietnam, for example) would be more similar than the DNA from two mosquitoes from different locations (such as Vietnam and Brazil). So we built a DNA reference databank of Aedes aegypti collected from around the world, and compared the DNA of the Aedes aegypti stowaways to this reference databank. We could then work out whether a stowaway mosquito came from a particular location. We identified the country of origin of most of the Aedes aegypti stowaways. The majority of these mosquitoes detected in Australia are likely to have come from flights originating in Bali. Here’s where the Aedes aegypti mozzies come into Australia and New Zealand from. Now we can work with these countries to build smarter systems for stopping the movement of stowaways. As the project continues, we will keep adding new collections of Aedes aegypti to our reference databank. This will make it easier to identify the origin of future stowaways. As Aedes aegypti has existed in Australia since the 19th century, the value of this research may seem hard to grasp. Why worry about invasions by a species that’s already here? There are two key reasons. Currently, Aedes aegypti is only found in northern Australia. It is not found in any of Australia’s capital cities where the majority of Australians live. If Aedes aegypti established a population in a capital city, such as Brisbane, there would be more chance of the dengue virus being spread in Australia. The other key reason is because of insecticide resistance. In places where people use lots of insecticide to control Aedes aegypti, the mosquitoes develop resistance to these chemicals. This resistance generally comes from one or more DNA mutations, which are passed from parents to their offspring. Importantly, none of these mutations are currently found in Australian Aedes aegpyti. The danger is that mosquitoes from overseas could introduce these resistance mutations into Australian Aedes aegpyti populations. This would make it harder to control them with insecticides if there is a dengue outbreak in the future. In our study, we found that every Aedes aegpyti stowaway that had come from overseas had at least one insecticide resistance mutation. Most mosquitoes had multiple mutations, which should make them resistant to multiple types of insecticides. Ironically, these include the same types of insecticides used on planes to stop the movement of stowaways. We can now start tracking other stowaway species using the same methods. The Asian tiger mosquito (Aedes albopictus) hasn’t been found on mainland Australia, but has invaded the Torres Strait Islands and may reach the Cape York Peninsula soon. Worse still, it is even better than Aedes aegypti at stowing away, as Aedes albopictus eggs can handle a wider range of temperatures. A future invasion of Aedes albopictus could take place through an airport or seaport in any major Australian city. 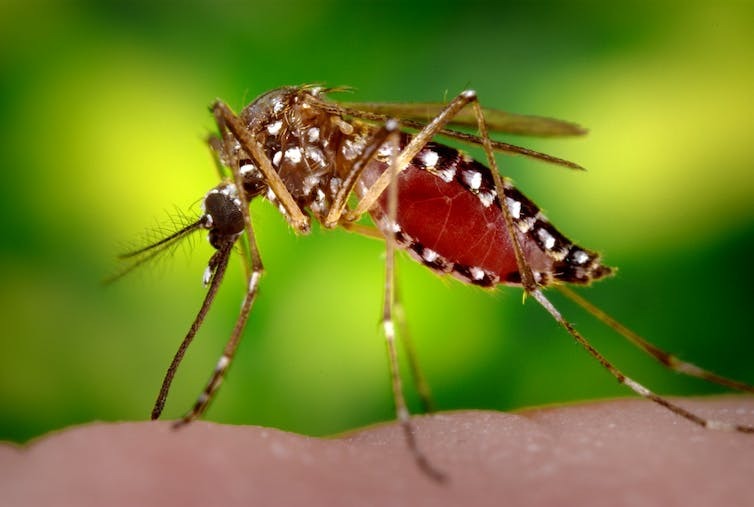 Although it is not as effective as Aedes aegypti at spreading dengue, this mosquito is aggressive and has a painful bite. This has given it the nickname “the barbecue stopper”. Beyond mosquitoes, our DNA-based approach can also be applied to other pests. This should be particularly important for protecting Australia’s A$45 billion dollar agricultural export market as international movement of people and goods continues to increase. Notorious for spreading diseases like malaria and Zika virus overseas, mosquitoes contribute to thousands of cases of human disease in Australia each year. But only half of Australia’s approximately 400 different species of mosquitoes have been scientifically named and described. So how are scientists able to tell the unnamed species apart? Mosquito populations and our ability to predict disease outbreaks are likely to change in the future. As climates change, disease-carrying mozzies who love the heat may spread further south into populated cities. As human populations continue to grow in Australia, they will interact with different communities of wild animals that act as disease reservoirs, as well as different mosquito species that may be capable of carrying these diseases. The expansion of agricultural and urban water storages will also create new homes for mosquito larvae to mature, allowing mosquitoes to spread further throughout the country. Mosquito larvae need a body of water to mature in. Mosquitoes like the native Common Banded Mosquito (Culex annulirostris) are known to spread human diseases such as Ross River virus, Barmah Forest virus, Dengue fever and Murray Valley encephalitis. It’s not the adult mosquito itself that causes the disease, but the viruses and other microbes that accumulate in the mosquito’s saliva and are injected into the bloodstream of the unsuspecting victim during feeding. The mosquitoes that bite humans are female, requiring the proteins in blood to ripen their eggs and reach sexual maturity. Male mosquitoes, and females of some species, are completely vegetarian, opting to drink nectar from flowers, and are useful pollinators. The life cycle of a mosquito. Mosquitoes belong to the fly family Culicidae and are an important part of our biodiversity. There are more than 3,680 known species of mosquitoes in the world. Taxonomists, scientists who classify organisms, have been able to formally name more than 230 species in Australia. The classification of Australian mosquitoes tapered off in the 1980s with the publication of the last volume of The Culicidae of the Australasian Region and passing of Dr Elizabeth Marks who was the most important contributor to our understanding of Australian mosquitoes. She left behind 171 unique species with code numbers like “Culex sp No. 32”, but unfortunately these new species were never formally described and remained unnamed after her death. This isn’t uncommon in biodiversity research, as biologists estimate that we’ve only named 25% of life on earth during a time when there is an alarming decline in the taxonomic workforce. Dr Marks’ unnamed species are still held in Australian entomology collections, like CSIRO’s Australian National Insect Collection, Museum Victoria and the Queensland Museum. Although all the major disease-carrying species of mosquitoes are known in the world, several of Marks’ undescribed Australian species are blood feeding and may have the capacity to transmit diseases. How do we tell mozzies apart? Naming, describing and establishing the correct classification of Australia’s mosquitoes is the first step to understanding their role in disease transmission. This is difficult work as adults are small and fragile, and important diagnostic features that are used to tell species apart, like antennae, legs and even tiny scales, are easily lost or damaged. CSIRO scientists, with support from the Australian Biological Resources Study, Government of Western Australia Department of Health, and University of Queensland, have been tasked with naming Australia’s undescribed mosquitoes. New species will be named and described based on the appearance of the adults and infant larval stages which are commonly intercepted by mozzie surveillance officers. New identification tools will also be created so others can quickly and reliably identify the Australian species. A 100 year old specimen of the native Common Banded Mosquito Culex annulirostris, capable of spreading Murray Valley encephalitis virus, one of 12 million specimens held in CSIRO’s Australian National Insect Collection in Canberra. Scientists are now able to extract DNA and sequence the entire mitochondrial genome from very old museum specimens. CSIRO are using these next generation techniques to generate a reliable DNA reference database of Australian mosquitoes to be used by other researchers and mozzie surveillance officers to accurately identify specimens and diagnose new species. CSIRO are also digitising museum specimens to unlock distribution data and establish the geographical boundaries for the Australian species. By naming and describing new species, we will gain a more complete picture of our mosquito fauna, and its role in disease transmission. This will make us better prepared to manage our mosquitoes and human health in the future as the climate changes and our growing human population moves into new areas of Australia. But the problem goes much deeper than this. Much plastic pollution is in the form of microplastics, tiny fragments less than five micrometres in size and invisible to the naked eye. Our new research shows that these microplastics are even getting into tiny flying insects such as mosquitoes. And this means the plastic can eventually contaminate animals in a more unlikely environment: the air. Microplastics can come from larger plastic items as they break down, but are also released directly into waste water in their millions in the form of tiny beads found in many cosmetic products including face wash and toothpaste (though these are now banned in many countries). Many tiny animals can’t tell the difference between their food and microplastics so end up eating them. Once inside an animal, the plastic can transfer via the food chain into fish and other creatures and eventually become a potential health problem for humans. Mosquitoes leave the water and take microplastics with them. By studying mosquitoes, we have found a previously unknown way for plastic to pollute the environment and contaminate the food chain. Our new paper, published in Biology Letters, shows for the first time that microplastics can be kept inside a water-dwelling animal as they grow from one life stage to another. Although most microplastic research has focused on the sea, plastic pollution is also a serious problem in freshwater, including rivers and lakes. Much of the freshwater research has concentrated on animals that live in the water throughout their life. But freshwater insects such as mosquitoes start their lives (as eggs) in water and, after several stages, eventually fly away when they grow up. It occurred to us that aquatic insects might carry plastics out of the water if they were able to keep the plastics in their body through their development. We tested this possibility by feeding microplastics to mosquito larvae in a laboratory setting. We fed the aquatic young in their third larvae stage food with or without microplastic beads. We then took samples of the animals when the larvae shed their skin to become larger fourth-stage larvae, when they transformed into a non-feeding stage called a pupa, and when they emerged from the water as a flying adult. We found the beads in all the life stages, although the numbers went down as the animals developed. Plastics were retained as the mosquitoes went through different life stages. We were able to locate and count the microplastic beads because they were fluorescent. We found beads in the gut and in the mosquito version of the kidney, an organ that we know survives the development process intact. This shows that not only do aquatic insects such as mosquitoes eat both sizes of microplastics, they can keep them in their gut and kidney as they develop from a feeding juvenile larva up to a flying adult. In this way, any flying insect that spends part of its life in water can become a carrier of plastic pollution. And flying insects are eaten in their thousands by predatory insects in the air such as dragonflies as well as by birds and bats. Our results have important implications since any aquatic insect that can eat microplastics in the water could potentially carry them in their body to their flying stage where they can move the plastics into new food chains. As a result, freshwater plastic pollution is a problem that has implications far beyond those of water quality and eventual marine pollution. Clearly these results raise a number of questions, including what effect microplastics have on the survival and development of mosquitoes through their life stages. And we still need to examine the effect of different types and sizes of plastics on more species to see how widespread an issue this could become. Mosquitoes are the main vectors for dengue and zika. Insecticides are our best weapon against them. Chemical pesticides have been used for many years to control insect populations and remain the most important method of managing diseases carried by pests, including mosquitoes. However, insects have fought back by evolving resistance to many pesticides. There are now thousands of instances of evolved resistance, which make some chemical classes completely ineffective. The Aedes mosquito, largely responsible for the spread of viruses like dengue and zika, has globally developed resistance to commonly used chemicals, including pyrethroids. Pyrethroids are the most used insecticides in the world, which includes the control of dengue outbreaks and quarantine breaches at air and sea ports. In Asia and the Americas, pyrethroid resistance in Aedes mosquitoes is now widespread. In Australia, our mosquitoes have not developed these defences and pyrethroids are still very effective. The difference lies in our stringent and careful protocols for chemical use. As the global community fights zika and other mosquito-borne diseases, there are lessons to be learned from Australia’s success. Mosquitoes usually become resistant to pyrethroids through the mutation of a sodium channel gene that controls the movement of ions across cell membranes. Mutations in a single gene are enough to make mosquitoes almost completely resistant to the level of pyrethroids used in insecticides. The mutations first arises in a population by chance, and are rare. However, they rapidly spread as resistant females breed. 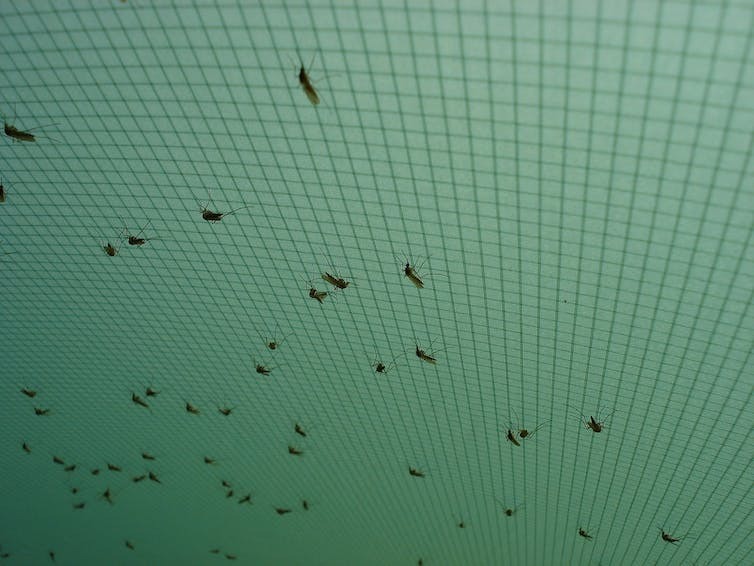 The more times a mosquito population is exposed to the same chemical, the more the natural selection process favours their impervious offspring. Eventually, when many individuals in a population carry the resistance mutation, the chemical becomes ineffective. This can happen where insecticide “fogging” is common practice. Overseas, fogging is sometimes undertaken across entire neighbourhoods, several times a month, despite concerns about its effectiveness as well as its environmental and health impacts. 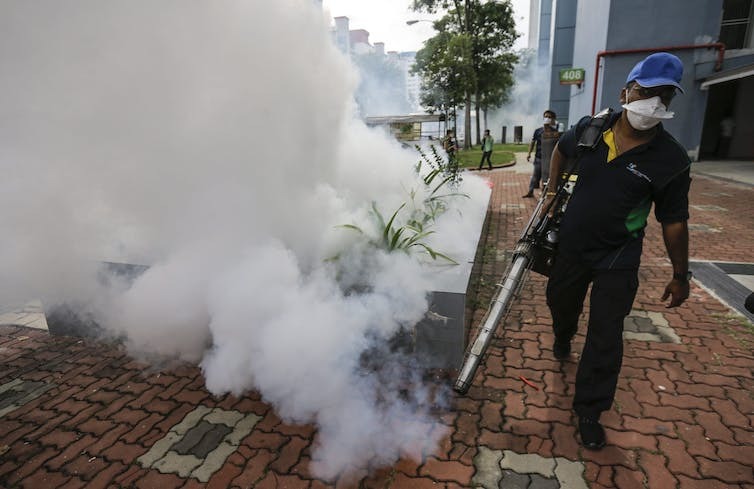 A pest exterminator carries out insecticide fogging in an apartment block in Singapore. Once resistance develops, it can spread to non-resistant mosquito populations in other areas. Pest species, including mosquitoes, are often highly mobile because they fly or are carried passively (in vehicles, ships and planes) at any stage of their life cycle. Their mobility means mutations spread quickly, crossing borders and possibly seas. Despite this, Australian populations of Aedes mosquitoes remain susceptible to pyrethroids. Aedes aegypti (the yellow fever mosquito) is the main disease-carrying mosquito in Australia. Its population is restricted to urban areas of northern Queensland, where dengue can occur. Recent research found that all Australian populations of this species are still vulnerable to pyrethroids. None of the hundreds of mosquitoes tested had any mutations in the sodium channel gene, despite the high incidence of such mutations in mosquito populations of South-East Asia. A female Aedes aegypti mosquito during a feed. We believe these mosquitoes remain vulnerable to pyrethroids because in Australia pressure to select for resistance has been low. Australia does not carry out routine fogging. If dengue is detected in an area, pyrethoids are used in highly regimented and limited fashion. Spraying is restricted to the insides of premises within selected house blocks, and then only for a short period. Importantly, water-filled artificial containers, which can serve as a habitat for larvae, are treated with insect growth regulators, which do not select for the pyrethroid resistance mutations. With chemical resistance growing around the world, it is more urgent than ever that we co-ordinate action to control and reduce risk of resistance. Unfortunately, no global guidelines exist to minimise the evolution of resistance in mosquitoes. Adopting pesticide resistance management strategies has proven to be effective against other pests – for example, the corn earworm (Helicoverpa armigera). Guidelines include rotating different class of pesticides to deny pests the chance to develop resistance, and investing in non-chemical options such as natural predators of target pests. Resistance management strategies are particularly critical for new pesticides that have different modes of attack, such as preventing juvenile insects from moulting, or attacking various chemical receptors. To prolong the effectiveness of pesticides, we must develop these strategies before resistance begins to develop. North Queensland may be an example to the rest of the world on the best path forward.